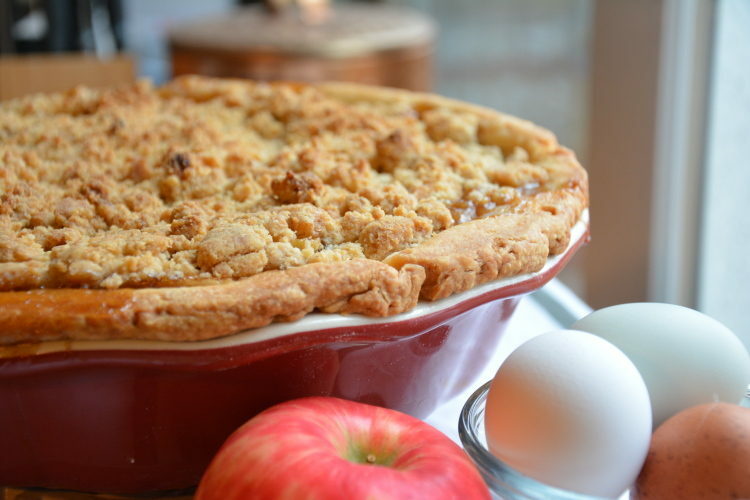 Apple pie is an iconic dish in the US and symbolizes everything from Mom to home to Americana itself . . . as American as apple pie. Apple pie actually originated in Europe, and Europeans enjoyed apple pie long before Europeans colonized America. The English, Dutch and Swedes brought apple pie across the pond and it only became possible here when European apple trees were established here. The only apple tree native to the US is the crabapple. 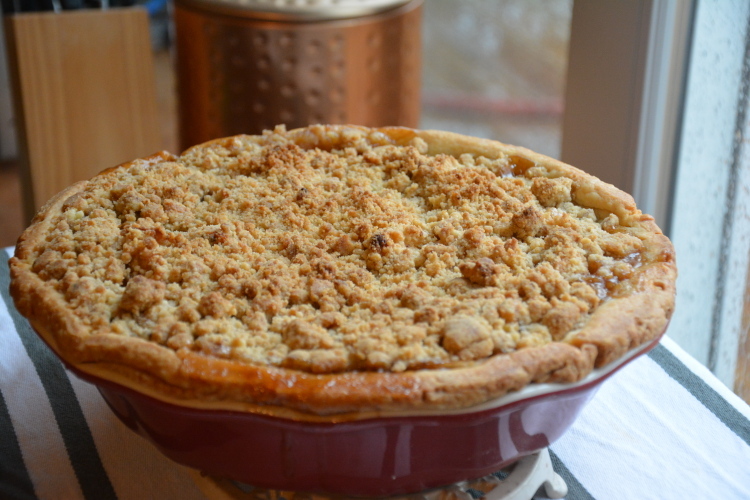 This recipe is laden with apples, cinnamon, caramel, and a buttery, sweet crumbled topping. Refrigerate pie crust in the shell for approximately 30 minutes prior to baking. In a large cast iron pot or Dutch oven, mix the apples, brown sugar, granulated sugar, cinnamon, salt, nutmeg and cornstarch and cook over medium heat, stirring occasionally, until the apples are just tender. Remove the cover and continue to cook for 5-10 minutes more until the sauce is thickened and develops a glossy sheen. Remove from the heat, stir in the lemon juice and allow to cool. Pour caramel sauce into the bottom of your pie crust and rotate to spread evenly. Pour apple pie filling on top. To make the topping, mix well the flour, sugar, cinnamon and salt. Add melted butter and mix until well blended. Spoon evenly over apples. I highly recommend using a pie shield to protect the crust edges during baking. Position a rack in the lower third of an oven, place a baking sheet on the rack and preheat the oven to 375°F. Place the pie dish on the preheated baking sheet. Bake until the crust is crisp and golden brown, about 1 hour. Transfer the pie to a wire rack and let cool. © 2018 Erika N. Wyatt & Life, Love and Lemons. All rights reserved. Sign up to receive recipes by e-mail. © 2018 Life, Love and Lemons & Erika Wyatt. All rights reserved.